Around 30 years ago, a hand-propelled lawn mower was a common sight in front gardens across the UK. Then along came electric lawnmowers which could do the work more quickly and with less effort – and they all but killed off the old manual version. But we’ve now come full circle and the push-mower that was such a familiar sight in Grandad’s garden shed is making a big comeback. A manual mower has many advantages over electric and one of the biggest is its eco-friendliness. A hand-propelled lawn mower produces NO emissions at all and it is also much quieter than a powered mower so it reduces noise pollution. If that’s not enough to make you consider a manual mower for your own lawn, then bear in mind its other huge benefit. It uses no fuel whatsoever – so it’s much better for your pocket as well as the environment. An added plus of a cylinder mower is that since it is powered by human force, it’s a great way to get some fresh air and improve your fitness levels. So instead of paying to go to the gym all summer, you could get a great workout and burn off lots of calories by mowing the grass instead. Unfortunately, a manual mower is not suitable for all gardens. If you have a very large garden then it’s probably not an option – and it isn’t likely to be suitable if your lawn is very bumpy or rocky. It copes very well with short grass, producing a lovely clean cut but if you don’t get time to cut your lawn often enough then you will struggle if you have to use it on longer grass. That said, it is the perfect choice for millions of average-sized gardens and thanks to its green credentials it is once again becoming popular with gardeners when their electric or petrol mower breaks down. Many people with larger gardens opt for a petrol mower rather than electricity and clearly, they are not the best environmental option but there are new, fuel-efficient models available with reduced emissions. 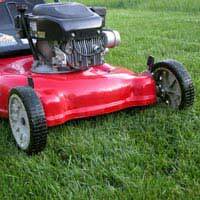 You may not think that cutting your lawn amounts to very much in the scheme of worldwide pollution but a study in Europe some years ago claimed that using a petrol lawn mower for an hour released the same amount of pollution as a car journey of around 100 miles. More recently, America’s Environmental Protection Agency has said that up to 5% of the USA’s air pollution could be down to the widespread use of gas-powered (petrol) mowers. In fact, it is of such concern that some states in America have now introduced schemes where householders can trade-in their petrol mower for an energy efficient electric alternative. Of course, electric mowers are only as environmentally-friendly as the power station that produces the electricity needed. That’s why people are now being urged to go back to hand-propelled mowers if they have a suitable garden. If your garden is too big or uneven for a push-along mower, you could consider one of the new rechargeable mowers. With improvements in rechargeable batteries they are now available with longer battery life than ever before and use less power than traditional electric models. One Swedish manufacturer has even introduced an automatic solar-powered lawn mower which gets on with the grass cutting itself, leaving you to get on with other tasks in the garden. At the moment the price is prohibitive but as governments look at all the options available for reducing pollution and cutting energy use it is likely that this type of automatic solar powered mower will come down in price over the next few years. How Easy is it to Generate Your Own Solar Power?